Home ☢ Geetha's What to Watch ☢ Geetha’s What To Watch: Rough Night and more! Ahoy there ladies and gents! What’s new and exciting in your world? Besides the fallout from the political drama of recent weeks, that is 🙂 Getting pretty hot out there, ain’t it? Methinks this summer will be hot and intense in more ways than one… but, back to the point. There’s not much happening in the way of new flicks, other than this one comedy that seems to have irked many. Let’s have a look-see! Four friends get together at a Miami beach house for a bachelorette party and accidentally kill a stripper. Unlike VERY BAD THINGS, this is a comedy and features female protagonists—awesome ones. 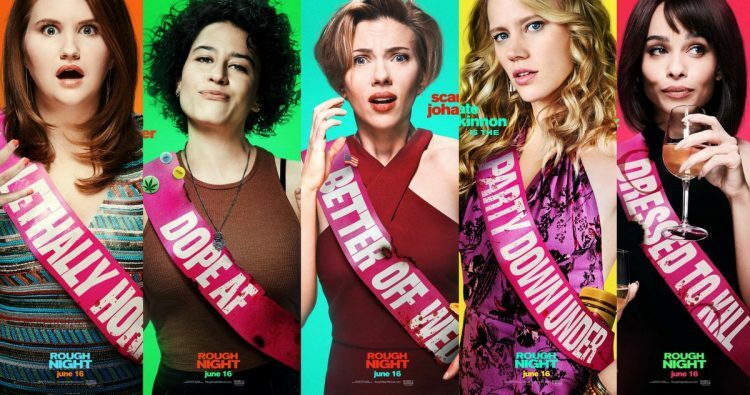 There’s Jess, an aspiring politician (Scarlett Johanssen); the promiscuous Alice (Jillian Bell); cokehead SJW Frankie (Ilana Glazer); Blair (Zoe Kravitz), Frankie’s former lover, and the Aussie Pippa (Kate McKinnon). Does it work? Kinda. Sorry to give you such an ambiguous answer, but, that is the most accurate one. It all depends on what you’re looking for. All four actresses have a great time with their roles. Jillian Bell’s zinging delivery of those one-liners is bound to impress. Ilana Glazer’s toned-down (if coked-up) version of her BROAD CITY character Wexler is excellent; McKinnon strangeness is a nice departure from the stereotype; and Johanssen is perfect as the glue holding the story together. Good times, good times! Well, in the beginning, at least. And now for some truth 🙂 I think the biggest problem is the fact that you won’t get any sense of the characters being in any real danger. In fact, if you feel emotional investment in the story is central to your enjoyment of a film, do not go—you’ll be totally bored. The break-neck pace doesn’t help a thing. And I’m pretty sure some of you will end up hoping that plans for the sequel fall as flat as some of those one-liners do. And there’s always WONDER WOMAN. Some of the intensity around this super amazing flick has died down and you’ll probably be able to find a good seat. Gal Gadot rocks! So here’s to good times at the movies, and let me know how it goes! I have watched this movie. I and my friend actually enjoyed the movie.